Private spaceship maker SpaceX announced plans Tuesday (April 5) for a new heavy-lift rocket, a vehicle that would be the most powerful commercial rocket ever built and haul much heavier loads than the company's previous boosters. "This is a rocket of truly huge scale," SpaceX founder and CEO Elon Musk said today during a press conference. The new rocket will be able to carry about 117,000 pounds (53,000 kilograms) of cargo to orbit - about twice the payload-carrying capability of the space shuttle. The Falcon Heavy would launch more than twice as much weight as the Delta 4 heavy, currently the most powerful rocket in operation. Only NASA's Saturn 5 moon rocket, which last launched in 1973, could carry more cargo to orbit, SpaceX officials said. Musk said the rocket should lower the launch cost of cargo to about $1,000 per pound, about one-tenth the cost per pound on NASA shuttle launches. The price for a launch aboard the new Falcon Heavy is set for $100 million, compared to the $50 million price tag for a Falcon 9 liftoff, Musk said. 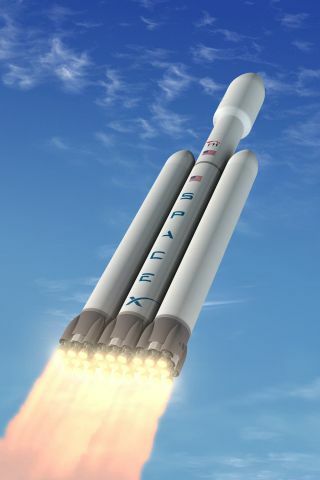 The first launch of the new heavy-lift rocket could come as early as 2013, Musk added. The development of a heavy-lift vehicle is yet one more foray for the quickly growing commercial space firm, which hopes to play a vital role in American space activities in the decades to come. Musk said the heavy-lift vehicle was designed to human ratings standards, and could potentially carry humans to space. Given its strength, the rocket could even be used to send people to the moon or Mars, Musk said, though such missions would likely require multiple launches to send various components (such as the lander and the return vehicle) separately. This SpaceX fact sheet points out the major differences between the company's Falcon 9 rocket and its planned Falcon 9 Heavy booster. "It can launch people if need be and do so safely," Musk said of the Falcon Heavy. "It has so much more capability than any other vehicle I think we can start to realistically contemplate missions like a Mars sample return." The Hawthorne, Calif.-based SpaceX already has a $1.6 billion contract with NASA to use Falcon 9 and the company's Dragon capsule to launch cargo to the International Space Station after the space shuttles retire. The firm also hopes to outfit Dragon capsules to carry astronauts, and eventually transport both astronauts and space tourists to orbit. SpaceX also has more than $2.5 billion in launch contracts to deliver satellites to orbit over the next few years. The new Falcon Heavy is designed to stand 227 feet (69.2 meters) tall, and weigh about 3.1 million pounds (1.4 million kilograms). It would incorporate the standard Falcon 9 rocket, with two liquid-powered Falcon 9 first stage boosters strapped on its sides. It would initially launch from Vandenburg Air Force Base in California, but eventually could launch from Cape Canaveral Air Force Station in Florida as well. The current Falcon 9 can loft about 23,050 pounds (10,450 kg) to low-Earth orbit from its launch site in Cape Canaveral. Falcon Heavy boosters will boost that up to nearly 53 tons, Musk said. SpaceX has also developed a smaller rocket to launch medium-size satellites into orbit. The unmanned Falcon 1 rocket launched on its first successful flight in 2008.